With autumn in full swing and the holiday season just around the corner, November is the perfect time to explore all of the fun visitor events that Boston has to offer. View the complete calendar here and check out these top picks for events and activities all month long. The New England Aquarium, one of Boston’s most popular family attractions, presenting a diverse range of exhibits and educating visitors about the importance of preserving the marine ecosystem. 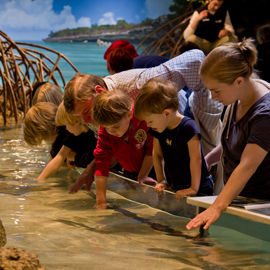 For a unique interactive experience, visitors should stop by The Trust Family Foundation Shark and Ray Touch Tank, houses several species of sharks and rays, including cownose rays, Atlantic rays, and epaulette sharks. Visitors can gently stroke these animals as they swim by in the open tank, set low enough for kids to participate as well. The exhibit is free with museum admission and opens daily at 9:30 AM. Sample food from local restaurants and shops in Davis Square on a food tour from Off the Beaten Path. Located just outside Boston in Somerville, MA, Davis Square is one of the city’s hippest and most diverse neighborhoods. Off the Beaten Path’s food tours offer a quirky, fun, and delicious walk through this historic area. Led by a local guide, visitors will sample everything from gyros and crepes to pizza and may even get to try some candlepin bowling along the way. These 2.5- to 3-hour tours run every Friday, Saturday, and Sunday and are appropriate for all ages. As one of the most-visited tourist attractions in the country, Boston’s Faneuil Hall is a must-see for any tourist in the city. 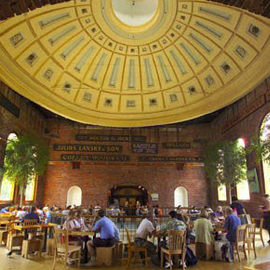 But for the complete experience, hop on one of Faneuil Hall’s free tours of Quincy Market. Learn about the history, architecture, politics, and geography of this iconic Boston institution. Tours are held every Saturday morning and meet at the property directory near Anthem Restaurant. For a look into the unsavory side of Boston’s history, hop on Boston By Foot’s Dark Side of Boston tour. This ninety-minute walking tour uncovers tales of misery, misfortune, malevolence, and murder on Boston’s streets, all based on true historical events. Hear tales of body snatchers, the Molasses Flood, robberies, murders, and more. Tours are held every Friday and Saturday in November at 6:00 PM. Children under twelve need to be accompanied by an adult.